by Elna Cain THE BEST marketers know something that many others don’t. They know how a consumer’s brain and behavior works. They understand one fundamental fact: people crave closure. It’s the ending to a movie or having to finish reading a chapter in a book before you do something else. You see this reflected in many ad campaigns for big brands. It can be seen in the images, the words, and the structures that are created during these campaigns. At the heart of many of these campaigns you will find the Zeigarnik effect. Have you ever wondered why a waiter could take your order, recite it back to you perfectly, and then less than half an hour later forget what you ordered? In the 1920s, Bluma Zeigarnik – a Russian psychologist – wondered the exact same thing. She noticed one day that a waiter had a better recollection of unpaid orders versus the ones that had already been paid. Her curiosity now piqued, she began to conduct research to unearth the answers. Surprisingly, she found that the human brain doesn’t like incomplete tasks. Because the task is not yet finished, we keep thinking about it over and over again. The information stays in our mind. Once the task is completed, your brain releases the information and you no longer think about it. That is also the Zeigarnik effect taking place. Even though scheduling your social media updates could wait, there’s that part of your brain that just absolutely refuses to leave a task unfinished. Well, the Zeigarnik effect is used in media and advertising all the time. You might not have noticed, but that’s the whole point – it works exceptionally well and it doesn’t scream marketing. 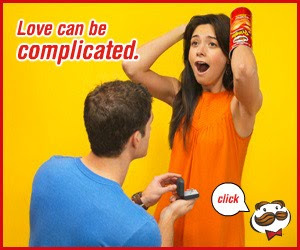 The ad had a call-to-action, inviting you to click. Each time you click, you saw a phrase or two of dialogue. But, by not telling consumers straight out what her answer was, you felt compelled to keep clicking that little banner until you reached the conclusion. It felt so satisfying knowing how that story ended. And, it was also one of the best examples of the Zeigarnik effect being used in a banner ad. So, people like to finish what they start. It seems like an obvious statement, but it was groundbreaking back in Dr. Zeigarnik’s era. And even to this day, marketers use the Zeigarnik effect to increase conversions. As small business owners and marketers, it’s vital that once you grow your list, you nurture your list for conversions. And for this to happen, you need a high open rate to begin with. Let’s look at two simple but effective ways you can use the Zeigarnik effect in your own email subject lines. According to marketing specialist Issamar Ginzberg, when you use a period at the end of an email subject line it signifies completion. And in a way it makes sense: we are taught to end a sentence with a period. But without the ending punctuation, the sentence looks incomplete. By not using a period, it signals to our brain that something about that email is incomplete, and so we click to open it. When developing your email subject lines, you want to create something enticing that makes the user want to find out more. Utilizing the Zeigarnik effect, you can play on people’s desire to know the end of the story by using cliffhangers or incomplete thoughts. Progress bars satisfy the Zeigarnik effect by visually allowing people to see that they have unfinished tasks. Not only that, but people naturally like to keep track of their progress. With email marketing, you can create the illusion of a progress bar in email subject lines. For example, if you have a series you’re sending out, then you can label them in the format of: 1 of 5, 2 of 5, 3 of 5, and so on. 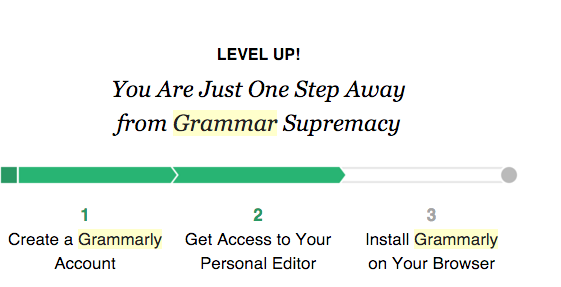 The Zeigarnik effect can also be seen in the emails Grammarly sends out. In fact, their entire email marketing campaign is built around the Zeigarnik effect. They send out weekly emails with visual cues to let you know how your progress with using the product is going. Also, images are very powerful in invoking a response from people. Having a visual representation of a user’s progress will resonate more strongly with their mind’s dislike of unfinished tasks, prompting the user to take action. OptinMonster employs the Zeigarnik Effect. They claim that marketers have seen as much as a 785% increase in conversions by using a two-step opt-in without split testing. 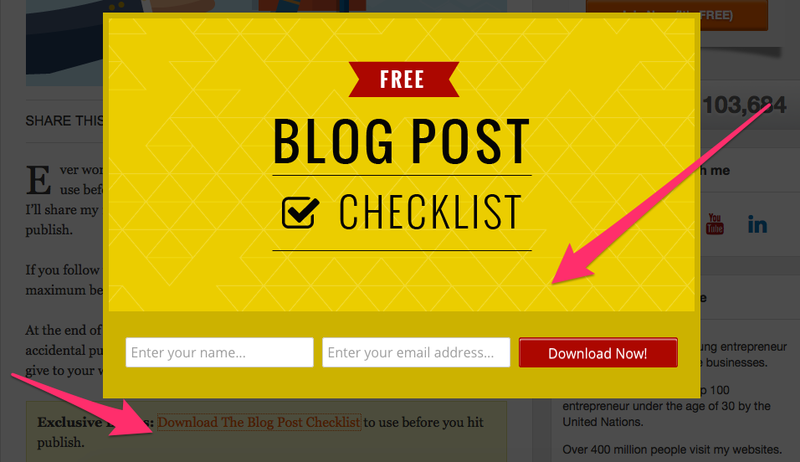 The idea behind it is when you click on the link, you’re shown a pop-up asking you to subscribe. And because the Zeigarnik effect states that a person will usually complete a task they start, the user will likely enter their email address. By understanding how to employ the Zeigarnik effect effectively with your opt-in forms, you can see amazing results. Nothing can overcome poor usability, and the Zeigarnik effect is no exception. Let’s say you want a user to sign up for your mailing list, but you also want them to enter their full name, phone number, and click a couple of check boxes. Not only does it take some effort to complete, but you’re also crossing over into some personal boundaries that the user might not feel comfortable divulging. True, they started the task and their brain wants them to finish it. But the reward for finishing the task isn’t valuable enough – or worth the time – to complete, and even employing the Zeigarnik effect can’t overcome this. From cliffhangers that keep us coming back for more to marketing campaigns that evoke our curiosity enough to learn more, this basic psychological need for completion is powerful. The Zeigarnik effect can be used in many different areas of your email marketing strategy. From enticing your subscribers with your email subject line to using a two-step opt-in to build your list quicker. Over to you – how have you used the Zeigarnik effect in your email marketing strategy?